In Lucignano, the Casa Vacanze I Girasoli offers rooms and bungalows, also accessible to people with limited mobility, in the enchanting Tuscan countryside and roads that lead to the magnificent cities of Siena, Florence and Perugia, Lake Trasimeno and Cortona. 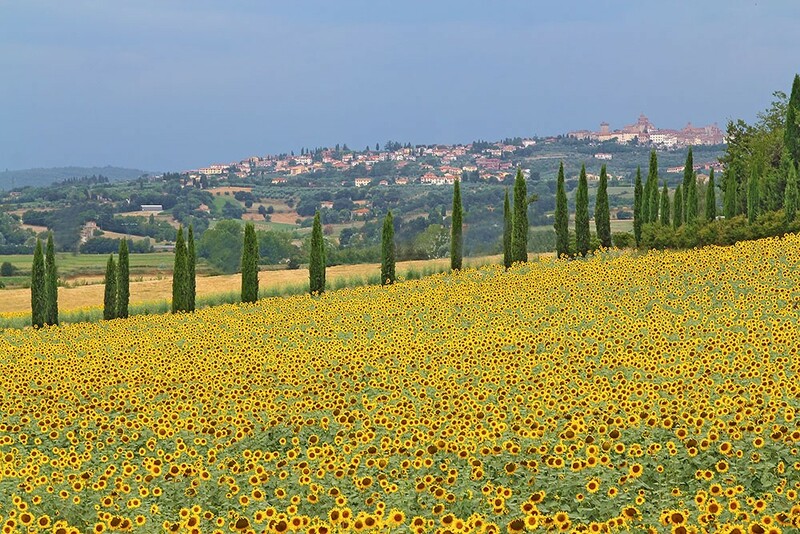 The nearby A1 highway (Rome - Florence) and Siena - Perugia expressway provide fast access, in addition to all the most beautiful Tuscan cities, to magnificent itineraries such as the Crete Senesi, the Arezzo and Chianti wine roads. La Casa Vacanze I Girasoli is also just 5 minutes from the Valdichiana Outlet stores. 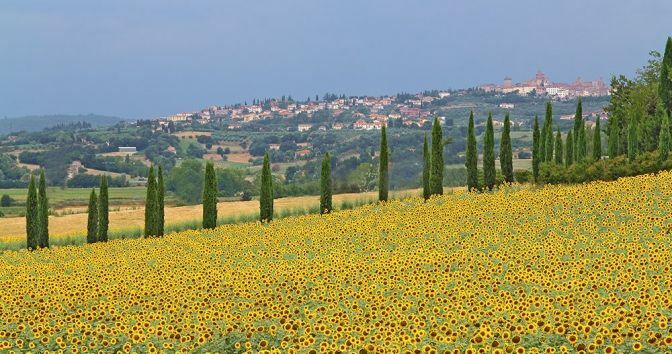 You are just a thirty-minute drive away from Val d'Orcia, Montalcino and Montepulciano, timeless sites that add charm and romance to your stay in Tuscany, where the Casa Vacanza I Girasoli awaits you just outside the medieval village of Lucignano, in Val di Chiana. Driving along the A1 highway (Autostrada Del Sole) from north to south, exit at Monte San Savino (after Arezzo) and follow the signs for Lucignano; once in the village, head toward the Croce di Lucignano hamlet where, near the roundabout, you'll find the road sign for the Casa Vacanze I Girasoli; after crossing Croce, continue for about 2,5 km until you reach Selve di Sotto locality (not signaled), where on the right you will find the road sign of I Girasoli at the entrance of the gravel road to the hotel. Driving along the A1 highway (Autostrada Del Sole) from south to north, exit at Bettolle-Valdichiana, follow the signs for Foiano della Chiana to Le Farniole and then turn toward Valdichiana Outlet Village, go past it and follow the signs for Lucignano. About 5 km before Lucignano, in Selve di Sotto locality (not signaled), on the left you will find the road sign of I Girasoli at the entrance of the gravel road to the hotel. Casa Vacanze I Girasoli provides free parking. The Arezzo train station is 35 k away. From here, take a taxi or use the transfer service to reach the hotel, booking when you reserve your room. The closest airport is in Florence (110 k). To reach the Casa Vacanze I Girasoli, take a taxi or use the transfer service, booking when you reserve your room. The Rome airport is 230 k away while the Pisa airport is 210 k away.